Monsteras are often called Swiss cheese plants or vines for their leaves’ lacy holes and notches, and Monstera adansonii is arguably the cheesiest of them all. Its leaves are more perforated and delicate than deliciosa’s and the plant is petite in comparison. And though all Monsteras are considered vines, Monstera adansonii has a trailing quality that makes it a good pick for hanging baskets or training around a room. As with many plant species, there is a lot of confusion about the different types. You might hear them called friedrichsthalii by sellers and growers (which appears to be the same thing), or more commonly obliqua, which others say is not the same at all. In truth, the Monstera adansonii is unique. These climbers have striking, perforated deeply green leaves that will make you the envy of any plant collector worth their sphagnum peat. But be warned: Monstera adansonii is an expert-level plant for most growers. For all its delicate beauty, growing Monstera adansonii is fairly straightforward. Plant it in a pot with drainage holes using a standard potting soil that contains peat. (Peat helps to trap moisture without becoming waterlogged.) 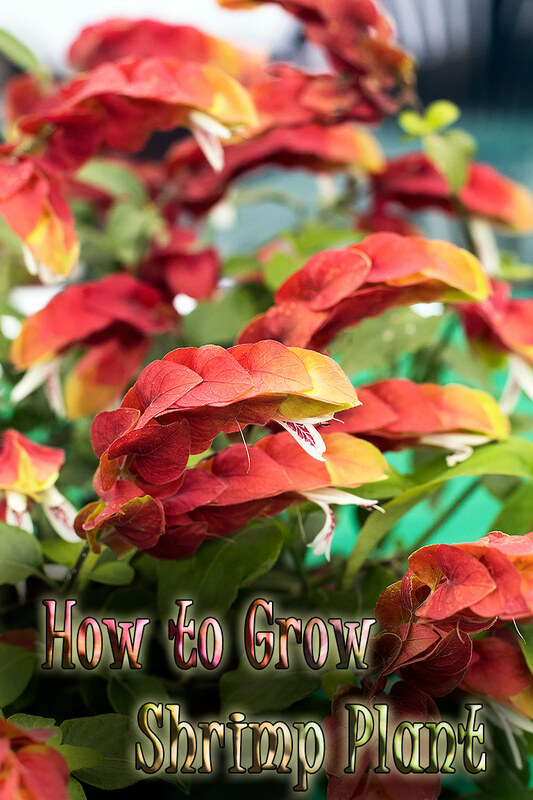 It will look best in a hanging basket or in a pot on a high shelf or somewhere else where its trailing vines can be shown off to advantage without getting in the way. Put the plant near a window where it will receive bright, but indirect, sunlight. Trim the vines as needed if they start to look scraggly to encourage new growth. Watering is the trickiest part of caring for Monsteras. They like consistently moist soil but don’t want to be soggy. They also like high humidity, which can especially be a challenge in winter, so consider using a humidifier. 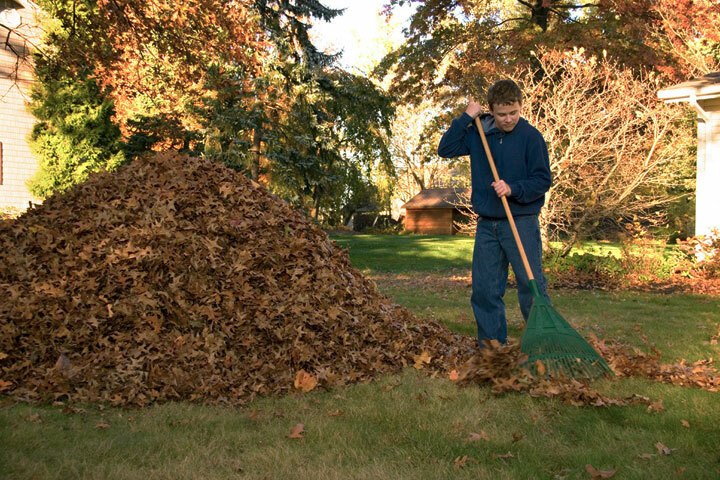 Yellowing leaves are a common issue and indicate that something about your watering schedule is off. Test the soil with a finger before you water: at least the top inch should be dry. On the flip side, make sure you’re not giving it so much water that the top layer of soil remains wet for several days at a time. Watering once a week should do the trick, though you might need to experiment with frequency based on the temperature and humidity in your home. Light: Bright light, but not direct sunlight. Water: High humidity. Keep soil continuously moist throughout spring and summer, and reduce watering in the winter. Temperature: Prefers warm and humid conditions. Keep above 60ºF if possible, but it can survive brief cold spells with some die-back. Soil: A very well-drained potting mix, including plenty of perlite. Almost an orchid mix. Fertilizer: Feed regularly with liquid fertilizer throughout the growing season. 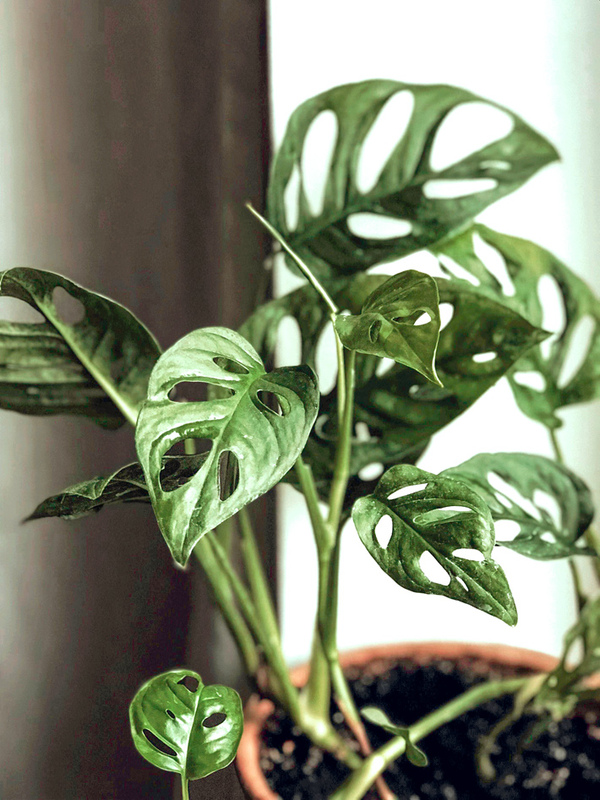 According to the ASPCA, Monstera plants are toxic to animals. If you decide to get one, make sure you put it where your cats and dogs can’t eat the leaves, which can cause irritation, mouth swelling, excessive drooling, vomiting, and difficulty swallowing. 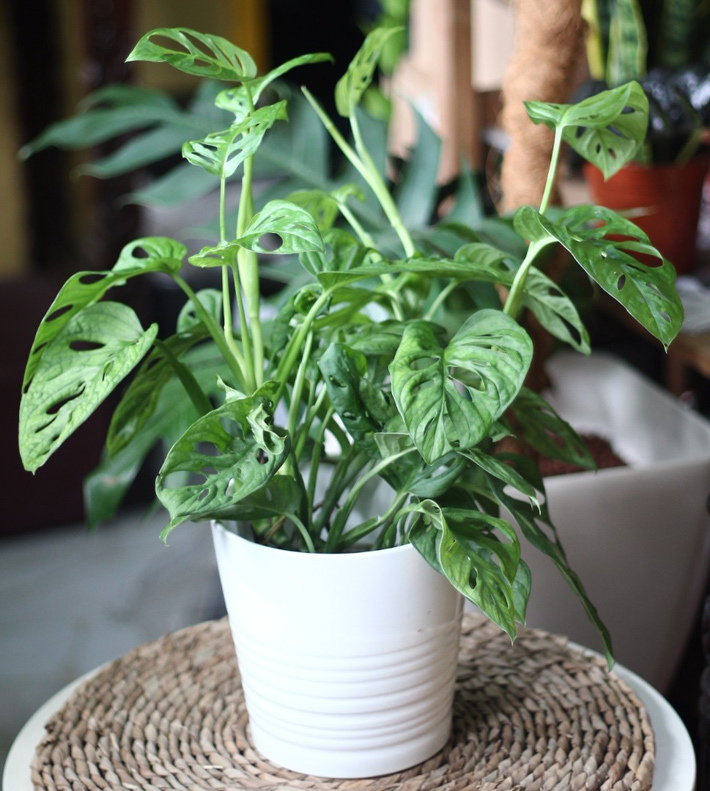 It’s easy to grow baby Monstera adansonii from your current plant. Snip off a section of vine that includes at least two nodes (those knobby bits where the leaves form). Set the vine in a glass of water until roots form and then plant the cutting in soil. You’ll have a brand new plant to give to a friend or trade at a plant swap. Remember, it can take a little while for new cuttings to root, so be patient and keep them in a moist, warm area. Many gardeners choose to bag their cuttings to seal in moisture and improve chances of survival. Monstera adansonii is best grown in a conservatory or greenhouse, where humidity, temperature, and light are all maximized. These are deep-jungle plants that thrive on very high humidity, lots of moisture during the rainy season and high temps. 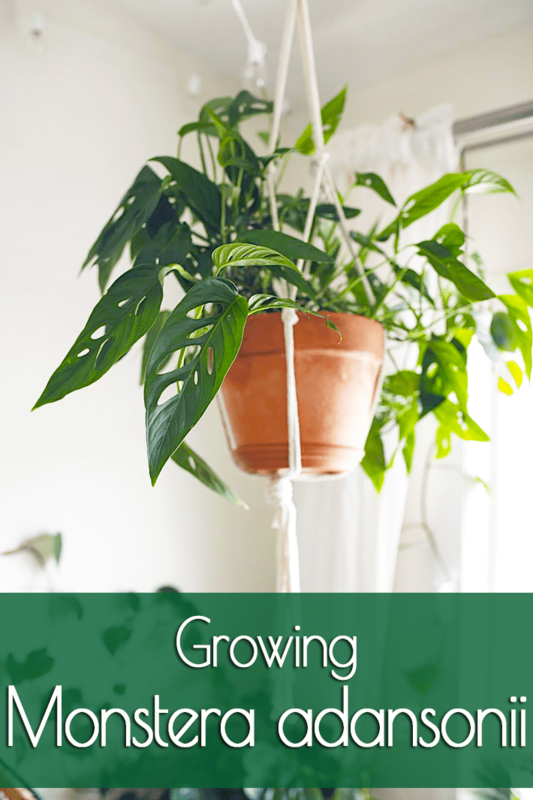 Adult plants are also climbers, so they can be aggressive if grown correctly. The closer you can mimic the plant’s natural conditions the better—choose well-lit, warm and humid bathrooms or kitchens, or mist plants frequently. 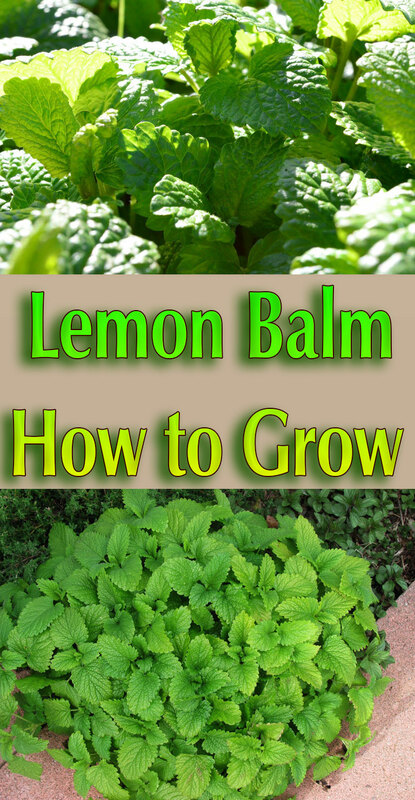 Move them outside in the summer and water daily, along with ample fertilizer.